Preheat the sous vide cooker to 132°F in a water bath according to manufacturers instructions. Salt and pepper steaks and place in a vacuum sealer or heavy-duty freezer Ziploc bag. Drop bag in the water bath for 2 hours. Remove the steak from bag and place it on paper towel-lined plate. Pat dry on both sides. Place a heavy cast-iron or stainless steel skillet with 1 tablespoon canola oil over the hottest burner you have and preheat the skillet until it starts to smoke. Place the steaks on grill. After 30 seconds, flip steak so the second side comes into contact with the pan. Repeat, flipping the steak every 15 to 30 seconds until it has developed a nice brown sear, about a minute and a half total (you can add a little butter to the skillet about 30 seconds before the steak is done for added richness). Remove steak to plate and let rest for 10 minutes before thinly slicing, against the grain. Bring the chicken broth to simmer in medium saucepan over low heat and keep warm. Add 1 tablespoon olive oil to a heavy large saucepan or skillet over medium-low heat. Stir in the shallots and garlic, stirring constantly for 3 minutes. Add rice and increase heat to medium. Stir until edges of rice begin to look translucent, about 3 to 4 minutes. 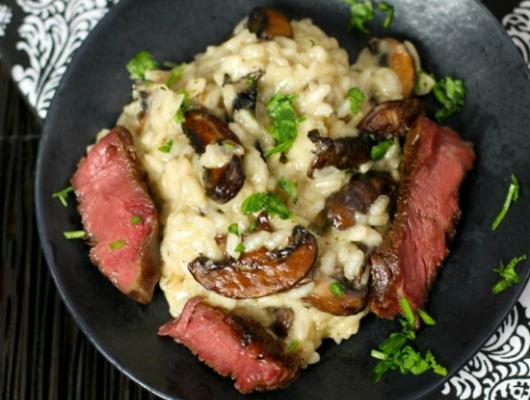 When the rice has taken on a pale, golden color, pour in wine and stir constantly until the wine is fully absorbed. Add ½ cup warm broth to the rice, and stir until the broth is absorbed. Continue adding broth ½ cup at a time, stirring continuously, until the liquid is absorbed and the rice is al dente, about 15 to 20 minutes. 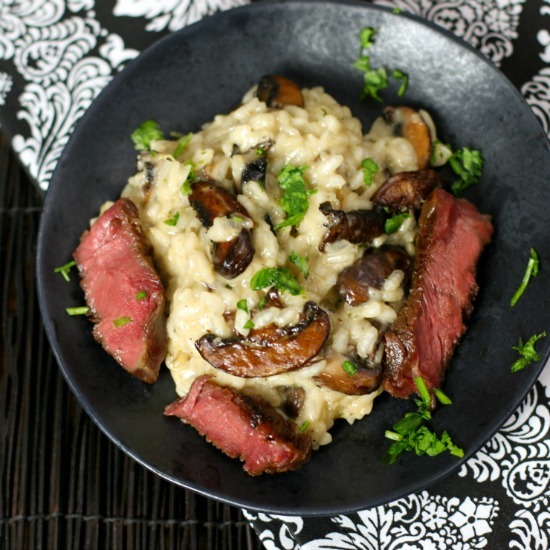 Rib Eye Steak and Mushroom Risotto are perfectly sous vide steaks with fall-flavored Arborio rice, full of cheese, garlic, shallots, and creamy, buttery goodness.